Friends of Shibui Trunk Show. 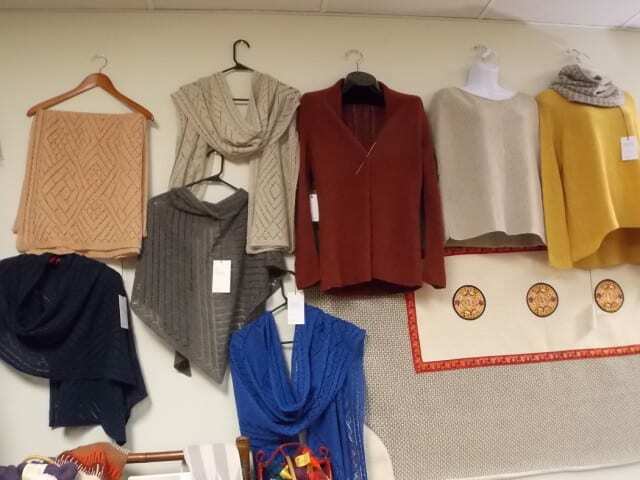 Another trunk show has arrived, another opportunity to see hand-knit garments in person, which is always better than in photographs. 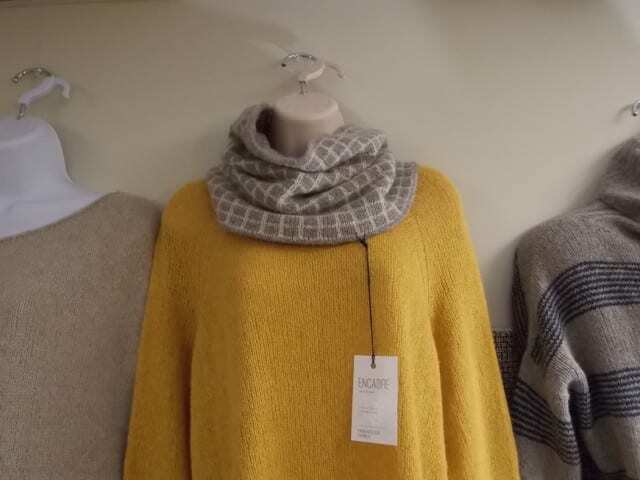 Come by the shop before November 24th, 2015, to see garments by independent designers Julie Hoover and Steve Rousseau knit in Shibui yarns! 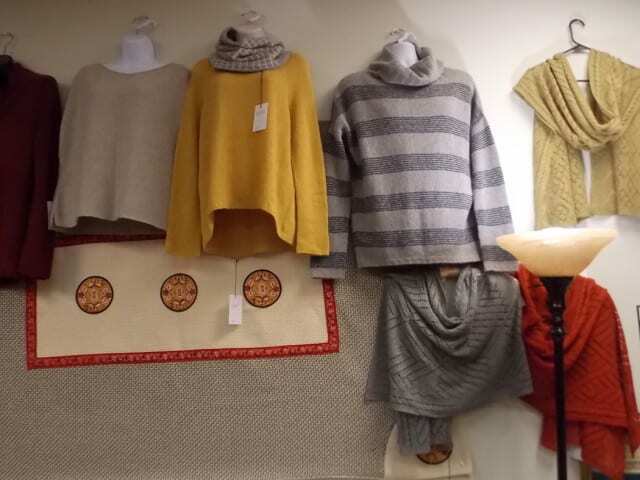 We have five of Julie Hoover’s designs on the wall, four sweaters and one cowl, and they all share that elegant, simple-with-a-twist aesthetic that Shibui is known for. Steve Rousseau’s designs are something very different: contemporary lace shawls with graphic, geometric motifs. We have seven of his rectangular shawls on display and one triangular shawl, and they all beg to be admired and studied closely. All the garments in this show are made with Shibui Pebble, a lace weight blend of 48% recycled silk, 36% wool, and 16% cashmere. 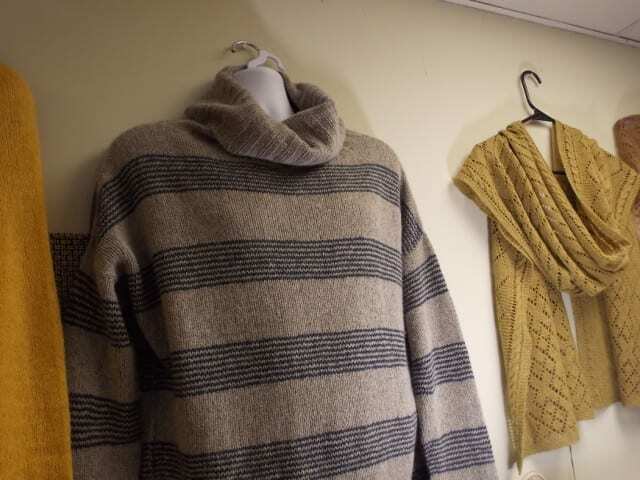 Most of these pieces use this delicate yarn held singly, but a few sweaters are knit with two strands of Pebble held together throughout, for a thicker fabric. All of the patterns are available as Ravelry In-Store Pattern Sales, where we print a copy for you and a digital copy is also saved in your email or Ravelry pattern library. 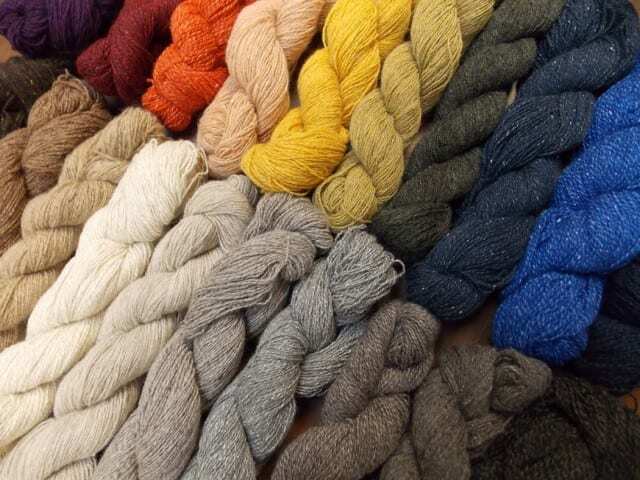 We’re offering all in-stock Shibui yarns at a 10% discount during this Friends of Shibui Trunk Show, so visit us before November 24th to plan your next project in Shibui yarns!